I have had a long love affair with DIY jewelry. I’ve made Glitter Watches, Clay Rings, and Wooden Bracelets. 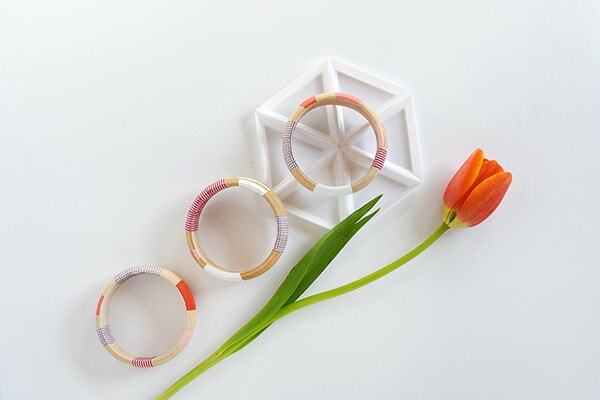 This month Oriental Trading Company challenged us to create something with colorful patterned Washi Tape and I knew I wanted to use the tape for another DIY jewelry piece! 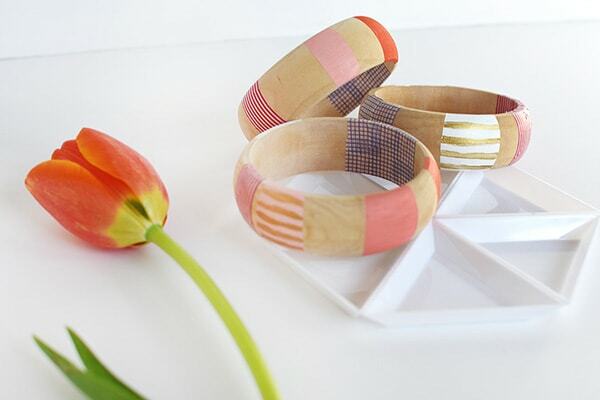 Today I am sharing how to use fun washi tape to create Striped Washi Tape Bangles. This is a project that I immediately fell in love with. Oriental Trading’s wooden bangles are such great quality. I didn’t have to sand them at all, they were ready to use right out of the box. Another plus for me, was how few supplies are needed to create such colorful and modern looking jewelry. I love wearing these bangles individually but when worn together as a set of three, it makes quite a bold fashion statement! I finished off the bangles with something special to really keep that washi tape on there. To see the full step by step tutorial for this colorful bracelet, head to Oriental Trading’s blog. 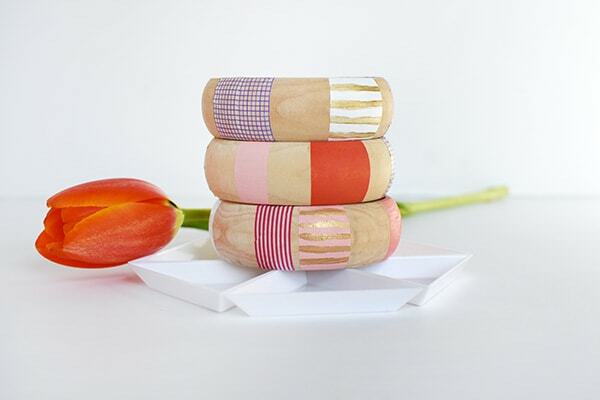 Carrie from Dream Green DIY created these DIY Washi Tape Jewelry Box. Haley from Design Improvised created Washi Tape Decorated Storage Crates. 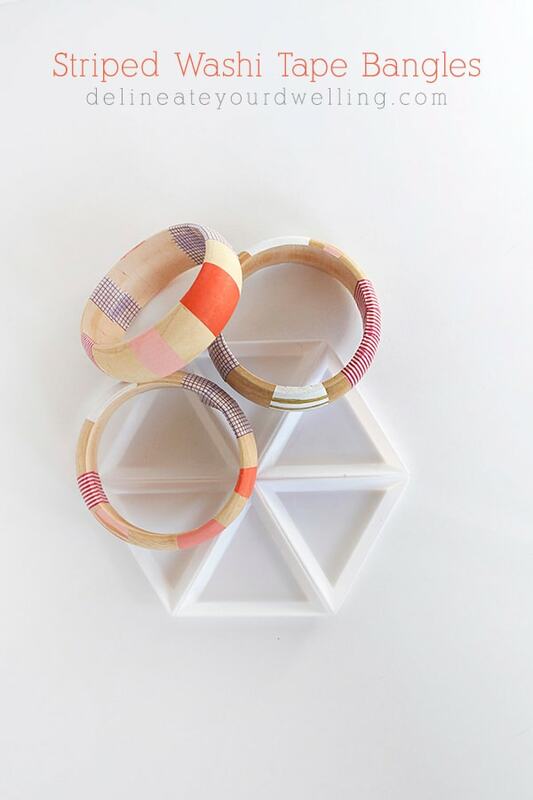 Sara + Melissa from Alice and Lois made DIY Washi Tape Frames this month. Great bracelets! Totally doesn’t look like washi tape. Very pretty and perfect for spring! Visiting from Tutorials and Tips. 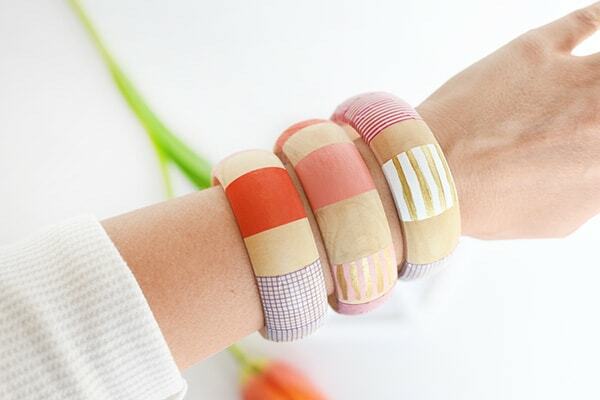 Can’t believe these are just made with washi tape! When I first saw them I thought you painted them. Such a fun and easy project! The tape adds a fun pattern to the bracelets, for sure! And I added sealer on the inside so the tape hasn’t come off. These are the cutest Amy!